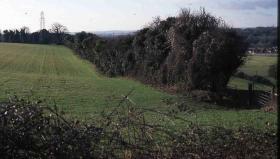 Hedgerows and boundaries in Horndean fall into about ten types. Examples of each type are found within the Parish. 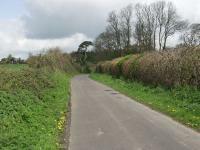 Hedgerows are a valuable part of the local landscape, they may be of great age and of historical importance and there are many in the parish that are of great importance to wildlife and the ecology. All the types merge one into the other, each has its own management options but an attemp to 'classify' into types provides a broad key or guide for surveyors describing a hedgerow. These different types were first described in the classic New naturalist book "Hedges" by Pollard, Hooper and Moore in 1974 (Fig.35) and saying that the different types were according to management or lack of management! Click on the thumbnail images for photo gallery. TYPE 0 - No Hedgerow at all ! This hedgerow was recently grubbed out without an application to the council, the only thing that has recovered is bramble. TYPE 1 - Very overgrown with a thick base and outgrowths. TYPE 2 - Overgrown with little undergrowth often removed by grazing. Many of this type and often a row of trees, prodominately oak and ash. Often have wide gaps, few are stockproof and so have to be reinforced with wire fencing. An important landscape feature in Horndean. 'f' and 'g' represent types 1 and 2 from the original sketch in the classic book "Hedges"
These hedges do provide good shelter for grazing animals as seen in this example in Blendworth. TYPE 3 - Overgrown with no undergrowth, just a row of thin tress. Little value to wildlfe, provides some shade for animals, not good when alongside roads, produces a 'flicker' for drivers. Not many in Horndean, this example is at the west end of Five Heads Road. TYPE 4 - Our standard well clipped hedge, box shape, flat top and 3 to 4 metres high. This type is very common in Horndean, particularly Lovedean where basic flail cuts annually are reducing hedgerows and in some areas large gaps in winter are just bracken or bramble. 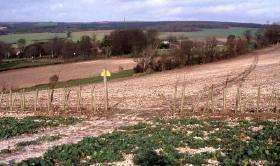 Their quality and value to wildlife will depend on having a good verge and sympathetic management programme. 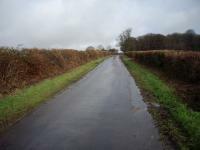 This type of hedgerow will benefit by having hedgerow trees and the need to tag some to grow on for future hedge trees. 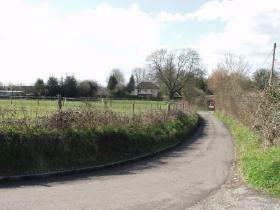 These two examples are towards Horndean's south-eastern boundary and Five Head's Road. TYPE 5 - Well clipped with an A-shape or gabled top, clipped on 2 or 3 year rotation. On the increase in Horndean with improved management schemes. The diagram shows the various profiles that we find locally (from Dowdeswell) These examples are found along Woodhouse Lane on our eastern boundary in June and February, there are more on the Chalton road and south east of Horndean. Good for wildlife and help to produce better undergrowth. Many now being spoilt by excessive Clematis and Ivy. TYPE 6 - Hard clipped, mechanically over-flailed or pollarded. Many are sadly 'overdone' and eventually reduced to bracken and bramble. 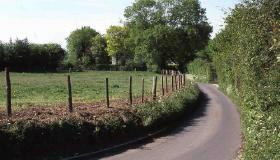 There are several on the south-west side of the parish mostly where there are arable fields. 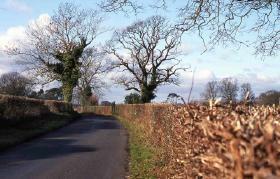 Here the surviving hedgerow trees are invaluable. many would be suitable for replanting, further into the field when adjoining narrow lanes. In one of these pictures a flail can be seen in action in the distance. This type of hedgerow is strangely popular with artists as seen in the painting done near Selbourne in winter. 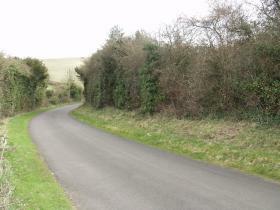 TYPE 7 - Well laid hedgerow in recent years. Stewardship schemes can help but is very labour intensive. 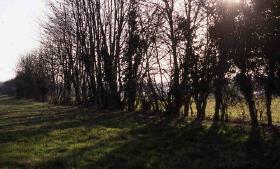 Good Ref: Hedgelaying Explained by Valerie Greaves, pub by National Hedge Laying Society. TYPE 8 - REMNANTS of a former hedgerow or boundary. Many can be found marked on old maps, particularly the 1st Edn 6"-1mile O/S. This is better than nothing and make a landscape feature. Often only one or two trees are left in the middle of a field. This is often the fate of Type 2 and 3 hedgerows. TYPE 9 - URBAN Hedgerows with one dominant species. The most popular hedging species are Hawthorn, privet, LLeylandii, box, Lonicera, beech hazel and yew. There is a good hedge in Catherington Lane of Hornbeam. All have different rates of growth and different degrees of density but one needs to look ahead to maintenance problems. TYPE 10 - URBAN hedgerows with mixed mostly native species. Some may be remnants of old boundaries through housing estates. Increases value if there is a variety of species producing blossom or fruit through the seasons to benefit wildlife and provide interest throughout the year. 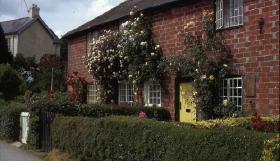 This hedgerow outside cottages in Catherington Lane contained up to 8 species when this photo was taken in June 1970 (in the good old days of Kodachrome!) Over the years some species may dominate. Usually less prone to Honey fungus than imported species.